Under HDUG tab, read all the details of membership registration, like, all the documents required for different categories and registration fees periodwise Click here to view details. Then proceed to registration form. Fill all the required details in the form, read the agreement and submit the form. Confirm the details entered and proceed to Make Payment page for Payment of fees. Payment can be done in three ways : All payment related information is given in Payment Information page under HDUG tab. Read the information and make payment accordingly. Once payment is done membership request will go to WPD. All the details and required documents will be checked at WPD and the membership will be accepted, rejected or will be put on hold with proper reason that will be mailed to the user who applied for membership. For offline membership the user can fill the membership form at the nearby Divisional/Subdivisional HDUG cell. 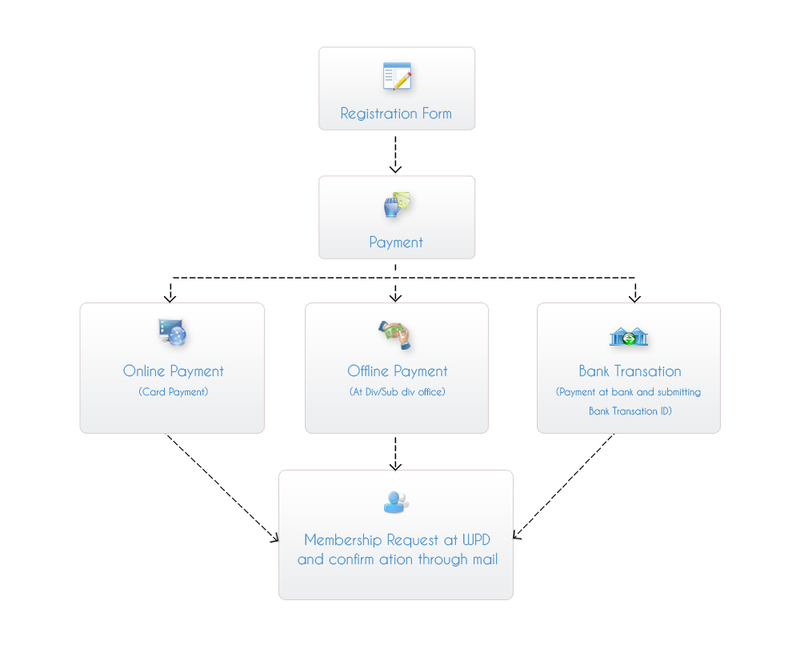 Payment and membership acceptance method is same as in online payment. When a member's membership has expired, he can renew his membership by sending renewal request. Membership expiry notification is given to the member 15 days prior to expiry date on edit member profile page when the member logs in. Even if membership has been expired, the member can login to renew his membership. After payment for renewal is done by any one of the above mentioned methods, request for renewal is sent to WPD where it is accepted and mail is sent to the member of membership renewal.